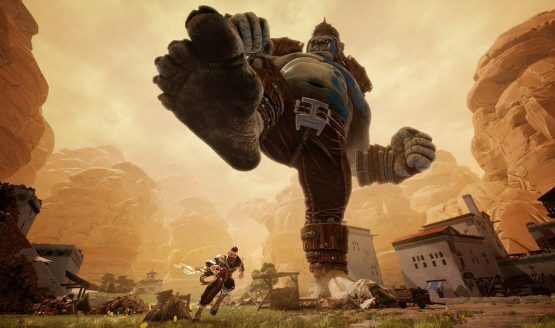 When I first saw Extinction my reaction was that it looked extraordinarily similar to Attack on Titan, which seemed to make the developers presenting it slightly uncomfortable. Obviously, every game wants to be able to be identified on its own merits, but I meant it sincerely as a compliment. I absolutely loved the recent Attack on Titan game and the fast-paced action against massive and monstrous enemies seems to be mimicked here in its own unique way. The goal in Extinction is to save humans from the oncoming evil. Ground combat is essentially a hack and slash game against regular sized enemies, but Avil, the game’s main character, can also rapidly run up walls to easily get to the top of the Ravenii, the massive ogre-like creatures that you see in the trailers. If there are no buildings nearby you can always run up the actual monster itself too, which will be necessary because the only way to take them out is to cut off their heads. Different Ravenni have different armor that needs to be removed before you can remove their limbs. Once you do, you can lop off their feet to keep them from moving and their hands to keep them from Hulk smashing Avil into a pulp. In fact, there are no arbitrary hit points in the game. If you get smashed by a monstrous fist or stepped on by a disgusting ogre foot, you will die. It’s not some massive attack that will take down a bunch of hit points. The team wants to make sure that the threat of the ogres feels real, and that climbing their hulking masses, attacking armor, and severing extremities feels like a monumental task, but one you can be proud of once a headless ogre is lying on the ground. Buildings appear to be fully destructible, so don’t think that retreating to the densely constructed parts of the city will keep you safe. The Ravenii will pursue Avil and tear down anything in their way. Different armor types will take longer to hack off, so the unarmored ones will be easiest to kill, followed by those donning wooden armor, all the way up to the golden armored terrors. Making your way through the game will earn you new combat skills to unlock, so though you may find even the easiest enemies tough at first, they’ve promised that Avil gains some pretty impressive moves for free flowing combat to aid in the destruction of these beasts. What I hope to see most from Extinction is a compelling reason to be doing this. I know that saving humans from monsters is an altruistic task, but I really want their main character to have some depth and intrigue as we make our way through the story. I also hope that there is some amount of variety throughout the game and it’s not just 30+ stages of climbing up massive ogres to dispatch them in the same way again and again. 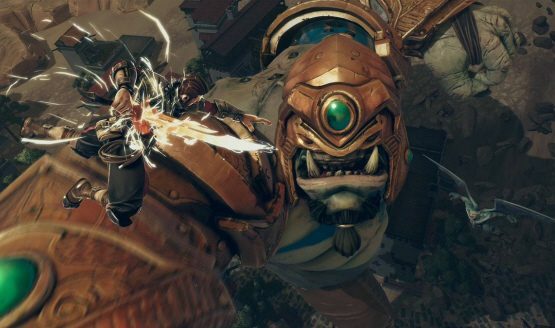 If they can nail these two points, I think that Extinction will be an enormously fun title, a David vs. Goliath style adventure that gives the power to the little guy. Extinction is targeted for a 2018 release on PS4, Xbox One, and PC. Check out all of our E3 2017 coverage.